Introduction – Kubatur is situated in Sorab taluk, Shimoga district of Karnataka. It is situated near Anavatti, another village which sometimes is confused with Kubatur. This confusion leads sometimes assignment of the Kubatur monuments to Anavatti. As per a legend, Anavatti got its name being the place where king’s elephants and horses were once tied. Kubatur is referred as Kuppatur in its inscriptions and associated with Nagarkhana-70 province. Bandalike was the capital of this province, while Kubatur would have been an important religious center. Like other places of antiquity, Kubatur is also associated with various legends. According to one legend, Kubatur is the ancient Kuntala-nagara, the capital of king Chandrahasa. R Narasimhachar tells that the Kali temple outside the village was the site where a wicked minister Dushtabuddhi, planned the murder of Chandrahasa, however his scheme failed and ultimately he killed himself in agony. A severed head lying near the temple is told to be that of the minister. Chandrahasa is mentioned in Mahabharata and his story is told in length in the Kannada poem, the Jaimini Bharata, composed by Lakshmisa, a famous Kannada poet of 16th-17th century. The story is of considerable romance and thrill, therefore it is mentioned in brief here. Chandrahasa was the son of a king of Kerala. He was born with six toes. His nurse fled with him to Kuntala after the death of his father and mother. But, soon the nurse met her death and Chandrahasa was left in destitute and started living on begging. Once he was passing through the house of a minister named Dushtabuddhi. The astrologers of the minister noticed the royal signs on him and predicted that one day he would be the king. Hearing this, the minister took secret measures to have Chandrahasa murdered in a forest. But the assassins relented on the boy Chandrahasa and contended themselves with cutting off his sixth toe which they produced as an evidence of his death. Meanwhile, Kulinda, an officer of that country, heard the cry of the boy and being pleased with his appearance took him as his son. Kulinda took him to Chandanavati and adopted him as his son. Chandrahasa grew up to be very useful and, by defeating some rebellious chieftains, obtained great praise and wealth for his father. This excited the jealousy of the minister and he paid a visit to Kulinda. There he found the story about his adoption and finding in a forest with a bleeding toe. He at once came to know that he is the same boy whom he tried to assassinate in the past. He at once sent Chandrahasa on an errand to the court. He gave him a letter in which he instructed his son, Madana, that the bearer of this letter should be immediately poisoned. Chandrahasa arrived the city however he was tired and slept in a garden. Meanwhile the daughter of the minister, Vishaya, came to visit the garden with the daughter of the king. Vishaya found Chandrahasa sleeping and at once fell in love with him. She found a letter, in his hand, written in her father’s handwriting. She remembered that her father, before leaving, told her that he would send a boy for her to marry. She opened the letter and read that. She changed the word ‘vishva’ to ‘Vishaya’ and sealed that again. When Madana read the letter, he executed his father’s wishes by arranging marriage of his sister with Chandrahasa. The minister arrived just at the conclusion of the marriage ceremony and was dumbstruck at this scheme. He tried another attempt to kill Chandrahasa, however his son, Madana, got killed instead. The minister went mad and left to a forest where he killed himself. Chandrahasa, taking the fancy of the king, is adopted as his heir to the throne and married to the princess. Interesting note is that none of the inscription at Kubatur mentions this association or legend. However, we find another legend from inscriptions. This legend if of demon Banasura and how he set up the Kotishvara linga. As per the legend, in the Krta Yuga, Banasura having discovered Kotishvara, setup in due form and with devotion, Ananta Kotishvara at Kubatur. Since then the fame of Ananta Kotishvara spread all over the region and Kubatur asserted its merit as a religious tirtha. The earliest inscription at Kubatur is dated 950 CE and refers to the rule of the Rashtrakuta king Krishna III. Due to the damaged nature of the inscription, not much information is available. By the eleventh century CE, Kubatur finds itself under the Kalyana Chalukyas. By then Kubatur had acquired the status of an immemorial agrahara comprising of thousand learned brahmans. With these thousand learned and distinguished brahmans, the town acquired the status of an important religious center. Kaitabheshvara Temple would have contributed the most on putting Kubatur on the religious radar. In the absence of a foundation inscription, year of construction of this temple cannot be determined with accuracy however as the earliest Kalyana Chalukya inscriptions refer to this temple, therefore the temple would have come in existence by the eleventh century if not earlier. As a religious center, Kubatur was not only an important Hindu center but also an equally important Jain center. In the eleventh century, during the rule of the Kadamba king Kirtti-deva, his senior queen Malala-devi, constructed a Jain temple dedicated to Parshvanatha. This temple was consecrated in the presence of the celebrated Jain teachers and priests from Bandalike. This would be a very grand celebration as the thousand brahmans of Kubatur agrahara, priests of Kaitabheshvara temple and priests from nearby Madhukeshvara temple of Banavasi joined the consecration ceremony. The Jain flavor of the town continued in the Vijayanagara period as we found grants and repairs made to the Jain Basadis in that period. Currently the town has only one Jain temple and it is a protected monument. Sadly it has lost the attention of the present Jain community. This fate is not only for the Jain basadis, but the Hindu monuments are also have lost the attention from their respective community. Being showered with grants, Kubatur would have been a very prominent and prospering village. There are few inscriptions talking about boundary disputes between Kubatur and Neralige. There are also many references of different attacks, besiege and wars during twelfth and thirteenth century. This period was a turbulent period in Karnataka history. The Kalyana Chalukyas, the Kalachuris and the Seunas were at wars with each other. Kubatur being in the middle of all this turbulence, would have suffered sufficiently however being a religious center, the different dynasties continued their support to its various temples and other religious activities. During the reign of the Seunas, the priests of the Kaitabheshvara temple attained the status of a raja-guru. Rudra-shakti-deva, then priest of the temple, was appointed as the raja-guru by Seuna king Simhana II as evident from his inscriptions. Rudra-shakti-deva was a Kalamukha priest and told to be a crest-jewel of the Kalamukha line. He is also referred as Mahavadi Ekkoti-chakra-varti. Being in vicinity of Balligave and other prominent Kalamukha centers, Kubatur would have contributed its share to the Kalamukha movement. The inscriptions at Kubatur provides a glimpse of its history from the tenth century onward and these link its unbroken history of about a millennium. An important inscription mentions a bond-servant slaying a tiger and a hero-stone getting raised in his honor. This suggests that the cast, creed etc. was not a restriction when honoring a brave person was in question. Another important inscription here mentions the Mughal rule over the town and some special arrangements catering to it. Monuments – Three temples at Kubatur are under the protection of ASI (Archaeological Survey of India). R Narasimhachar, officer in charge of Archaeological Researches in Mysore, visited Kubatur in 1911 and published details of these temple in his report. There are many other temples in town, the article here gives attention only to the protected monuments. 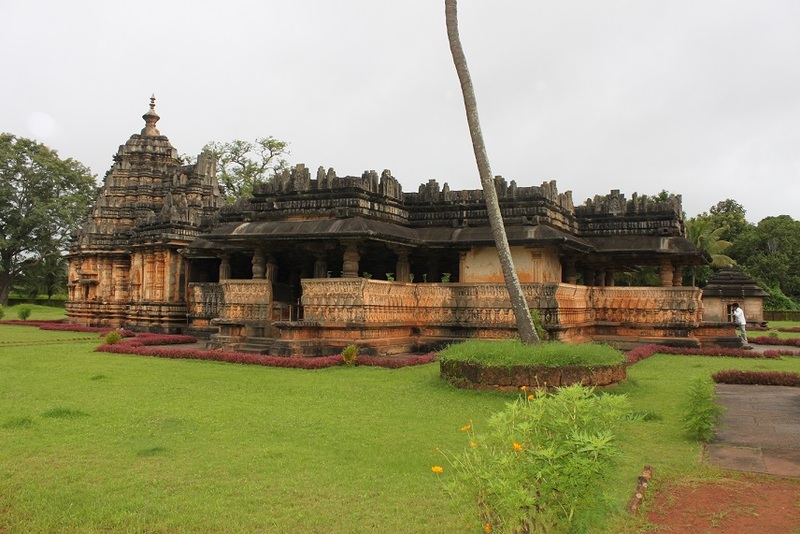 Rameshvara Temple – It appears to be the oldest temple in the village and in inscriptions referred as Mulasthana temple. Based upon inscriptional evidences, this temple could be assigned to the Rashtrakuta period. The earliest inscriptional reference of this temple is dated 1065 CE. The temple has a garbha-griha (sanctum sanctorum) with pradakshina-path around it, thus the temple falls in sandhara category which is not frequently seen in this region. The Mulasthana god is present in form of a shiva-linga inside the garbha-griha. Ranga-mandapa is directly connected to garbha-griha without any antarala (vestibule). The central ceiling of the ranga-mandapa, measuring 8 feet by 8 feet, is exquisitely carved. It depicts Shiva performing Tandava in the center, surrounded with ashta-dikpalas in eight directions. Shiva is shown with eight hands, standing over a demon, and accompanied with Nandi, Ganesha, Kumara and Parvati. The orientation of the dikpalas is erroneous, placement of Kubera and Agni have been interchanged. A sculpture of Sapta-matrikas and Mahishasura-mardini is placed in the ranga-mandapa. A Nandi-mandapa is constructed opposite the ranga-mandapa. This Nandi-mandapa is detached from the main temple. An another stone platform near the Nandi-mandapa has many stones depicting various serpent forms. Kaitabheshvara Temple – This temple is situated on the outskirts of Kubatur village, in a place popularly known as Kotipura. This place is referred as Devasthanada-hakkalu in Shimoga Gazetteer.ASI has assigned the temple under the boundaries of Kubatur village. A local and very recent legend associates this temple and that of Madhukeshvara at Banavasi with the legend of demon Madhu and Kaitabha who were slain by Vishnu. Though the demons were slain by Vishnu, however as they were devotees of Shiva therefore the temples are dedicated to Shiva. As per inscriptions and legends, it is stated that in the Krta Yuga, Banasura having discovered Kotishavra, set up in due form and with devotion, Ananta Kotishvara. Viswakarma built this temple with complete devotion and planned in perfect accordance with the many rules of architecture, and freely decorated with dravida, bhumija and nagara. It was adorned with all manner of pictures, its front brilliant with many golden kalasas decked with precious stones, its towers kissing the clouds. This single shrine temple is constructed with east-west orientation and is consisted of a garbha-griha, antarala, and a mandapa. The mandapa has multiple entries, five in total. Apart from the conventional three entrances, one each on north, south and east, the mandapa has two lateral entrances in addition. The tower above the garbha-grha is four tiered structure with a square shikhara on top. There is a projection in front of the tower however it is devoid of any Hoysala crest or simha-lalata. The mandapa is constructed in an indented fashion. The mandapa is an open hall with parapet walls all around. The pillars of the mandapa are highly ornamented and measures 11 feet in height. A variety of miniature shrines are carved on these parapet walls. Interestingly, this temple has a very important inscription which refers to the Bhumija style of temple construction. Probably, this is the only inscription in whole India which refers to this particular temple style. Inside the mandapa are four niches inside, two at the either sides of the vestibule and two on the opposite walls facing north and south respectively. These niches house Sapta-matrikas, Ganesha, Naga-stone and Vishnu. There are many icons placed above the eaves running around the temple. Ashta-dikpalas (Indra, Agni, Yama, Nrrti, Vayu, Varuna, Kubera and Ishana) are placed at their respective directions on the same level as other icons. Among important icons are found, Bhairava, Harihara, Brahma, Sadashiva, Tandava-Ganapati, Parvati, Uma-Maheshvara, Surya. Mysore Archaeological Report of 1941 mentions that the original bull was broken and removed some years ago. It was suggested in the report that either a new bull needs to be provided or the unbroken fine bull of the Panchalingeshvara temple at Belgami (Balligave) could be installed here. I doubt if the latter suggestion was implemented. 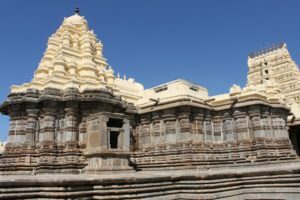 As stated earlier in this article, this temple could be safely placed to the eleventh century under the Kalyana Chalukya period. The god is referred as Kotinatha or Kotishavara in inscriptions. In the rising wave of the Kalamukha movement during eleventh and twelfth century, Kubatur also established itself as an important center of the sect. Its priest, Rudra-shakti-deva, attained the status of a raja-guru during the Seuna period of thirteenth century. An important Seuna inscription mentions that many other temples were attached to god Kotinatha. Seuna king Simhana II directed his official, Vasugi-nayaka, to adorn Kotinatha with the village of Tadasa of Kaginele in Basur-nad. Many other eminent people also made grants at that occasion. Siddhanatha temple of Kabbina-Sirivur, temple of stone svayambhu of Mulugunda, Ramanatha temple of Emmanur, Ramanatha temple of Kiruvade, Grameshvara temple of Abbalur, Mulasthana Vosavanteshvara temple of Tiluvalli, Chaitapura of Devangeri, Mulasthana of Hanungal and Rameshvara temple of Kuppatur were also attached to god Kotinatha. Some centuries later, when the attached villages to Kotinatha were in ruins, Vijayanagara king Krishna Deva Raya made a grant of five villages in the presence of Virupaksha-linga on the bank of Tungabhadra river, as evident from an inscription. Parshvanatha Basti –This Jain temple was constructed in 1077 CE under the auspices of the Kadamba queen Malala-devi, senior queen of the Kadamba king Kirti-deva. There was a very grand celebration during the consecration of the Parshvanatha image at that time. As informed by an inscription, this grand event was attended by the celebrated Jain teachers and priests from Bandanike, the thousand brahmans of the immemorial agrahara of Kubatur, the priests of Kaitabheshvara temple and the priests from nearby Madhukeshvara temple of Banavasi. This otherwise very plain and ordinary looking temple is devoid of any decoration inside or on exterior. Its outer walls were constructed of laterite blocks at some later point of time. The temple consists of a garbha-griha, a mandapa and an ardha-mandapa. There might be a large mukha-mandapa in front. The main image of seated Parshvanatha in the sanctum is about 5 feet high. Parshvanatha is shown seated under a canopy of a seven-hooded serpent. He is shown seated on a simhasana (lion pedestal) while two chauri-bearers are standing on either sides. There are two loose sculptures inside the mandapa. One image depicts Jina Parshvanatha standing under a canopy of a seven-hooded serpent. Another Jina image, in standing posture, is not identifiable. Narasimha temple – This temple has a curious image of Narasimha, who is shown seated wearing no crown. He is shown with two hands, right hand rested on the raised knee and left hand on thigh. The face is also more natural rather than a conventional lion, the god is called Chintamani Narasimha. Dyamavva temple – The main image in the temple is of a goddess shown with sixteen hands, riding a lion. This wooden image represents Mahishasuramardini as Mahishasura is shown at her feet. Prabhavali around the image is carved with ten avtaras of Vishnu and ashta-dikpalas at cardinal points. The total height of the image is about 10 feet.